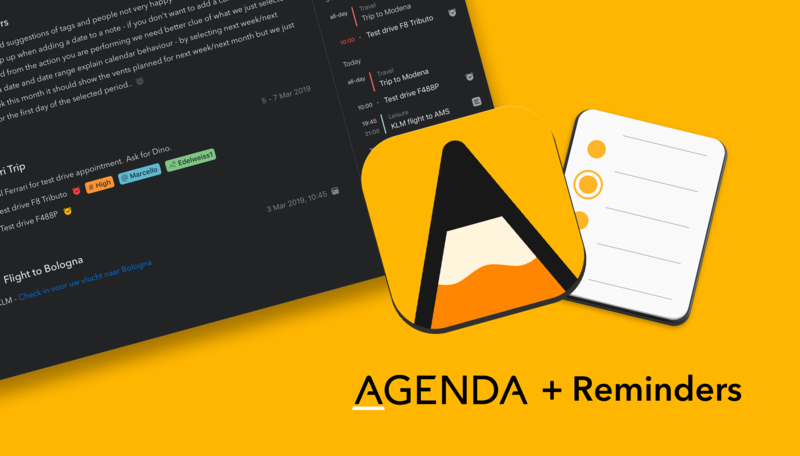 From day one, Agenda was fully integrated with the Calendar app on your Mac, iPhone and iPad. We chose to work in tandem with the built in tools, rather than develop a whole new calendar app. We’re super excited to give you a sneak peek at the update we’re preparing that brings that same level of integration for Apple’s Reminders app. Reminders is great tool for scheduling tasks that are due at a particular time or place; in just a few weeks time, Agenda will allow you to create and edit reminders without leaving the app. Just as for calendar support, we have opted to integrate with the existing Reminders app, rather than reinvent the wheel. You will be able to link reminders to list items in Agenda, so that you get a notification when they become due. Agenda will autofill as much information as possible, making it ridiculously easy to create new reminders for your tasks. There is even support for a markdown-like syntax, so you don’t even have to stop typing. And this all comes together in a redesigned timeline that gives you an overview of all your events and reminders in one place. A sneak peek at the upcoming reminders update. If you’d like to get early access and help us test the new update, you can do so by joining our beta program for macOS and iOS. The reminders integration looks sleek. Thanks for the clever in-line implementations. Looking forward to it, team! Grab your pitchforks, we’re going after Viticci! Congratulations guys, this seems like the most pragmatic development approach I have seen in iOS development. Too often everything is rebuilt from scratch rather than reusing the frameworks already available and, for me, that makes them unsticky and eventually unused. Many thanks for the encouragement, glad you like what’s coming! See this topic to join the macOS betas. To join the iOS testflight program please leave a post in this topic. Thank you so much your excitement and willingness to help test the next Agenda update. This looks just brilliant - can’t wait. Now if we could just get Spark to integrate fully to share links back and forth to email easily my whole productivity world could live in here! That looks like a real promising improvement. Will there be options for other Task apps such as Things3?? I’m afraid we are just integrating with the built in system Reminders, which is available to every app. Any app using that will effectively also be integrated directly with Agenda, but I am not sure if there are non-Apple apps doing that. So there won’t be direct integration with Things at this point, but perhaps it is something we can consider down the road. Well done guys! Super excited about this! And thanks for sharing the sneak peak video. Really well made! “\remind(soon)” – brilliant! Apps like Things and OmniFocus should be able to pull from Reminders, which is how I’m hoping to use this. You won’t be able to see and review Things/OF tasks in the timeline of course, but it’ll be a nice way of feeding tasks into those apps without needing to leave Agenda. Is there support for undated reminders? Can’t wait to see it. I’m user because I like your design approach. Congratulations to Alex and Drew! This new upcoming feature of integrating Reminders in Agenda looks like a really great and very useful improvement! In principle we only support date reminders to prevent that people’s timeline will get clobbered with dozens of items from a shopping list for example. Perhaps at some point we would allow you to opt-in of doing this, but it won’t be in the upcoming update yet.